Railpictures.ca - A.W.Mooney Photo: Looking back, I cannot recall seeing many of those SD-40F “Barns” running thru Bayview on CP. So it was a surprise to see one two days in a row on the Starlite, a Toronto-Hamilton and return train. The first time I saw it was from the highway…….and so, on a whim, went back the next day and parked at the RBG Walkbridge and got lucky. Nice and clean looking, it was barely a year old in this shot….Second unit is CP 5508. 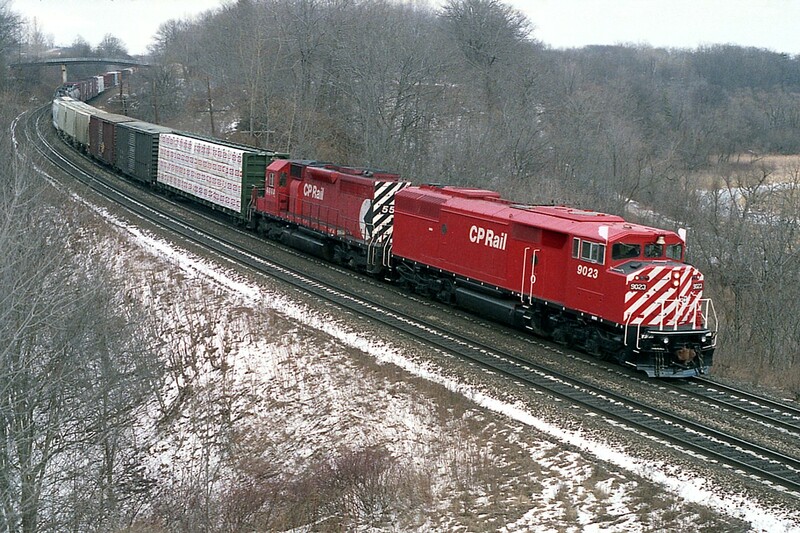 Most all of the series (9000-9024 were not around long; and by 2015 this unit was sold to the Central Maine & Quebec, where it languishes to this day. | Railpictures.ca – Canadian Railway Photography – photographie ferroviaire Canadienne. Caption: Looking back, I cannot recall seeing many of those SD-40F "Barns" running thru Bayview on CP. So it was a surprise to see one two days in a row on the Starlite, a Toronto-Hamilton and return train. The first time I saw it was from the highway.......and so, on a whim, went back the next day and parked at the RBG Walkbridge and got lucky. Nice and clean looking, it was barely a year old in this shot....Second unit is CP 5508. Most all of the series (9000-9024 were not around long; and by 2015 this unit was sold to the Central Maine & Quebec, where it languishes to this day. I don’t know exactly when the “Starlite” ended, Brandon; but I would assume it did when CP incorporated this train into its numbering system around this time. Rather than traffic moving on a train from HAM- to T.O. daily, it was rather incorporated into the daily BUF to T.O. trains. Thats my guess, anyway. Beautiful shot. What year did the Starlight end?